Are you curious about doing your own website SEO audit but confused about all the tools available? Want to learn more about using Google Search Console as a primary free tool for SEO audits? Note for photographers and other visual artists: this post uses my live photography website as the example site for SEO audit review. This SEO audit is applicable to all websites, but I’ve included some topics and tips that are of specific interest for photography websites and other image-centric websites. I also include a few affiliate links below for SEO PowerSuite software, which I personally do use and recommend. I may earn a small commission, at no additional cost to buyers, for purchases made via these links. I’ve been using the Google Search Console (GSC) tool very regularly for some time now, and I wanted to share a detailed post that walks through how I use it for doing website SEO audits. Google Search Console is one of several free Google SEO tools that I use on an almost daily basis. There are *many* tools available to all of us for doing website SEO audits. Some are free and others are paid. Google Search Console is the most important of the free SEO tools available. If you only use one free tool for doing an SEO audit of your website, Google Search Console should be the one. Let’s use Google Search Console to perform an example SEO audit. I’ll be using this site for this post and others to follow, to discuss various aspects of SEO and related tools. Sometimes I’ll refer to it simply as my ‘Photoworks’ website. David Kamm Photoworks is a WordPress website that I first built several years ago. I honestly haven’t spent much time on it in recent months (as of Oct 2018), but I do collect analytics from it using both Google Analytics and Google Search Console. And I want to continue improving it in terms of content and SEO. It’s certainly not the best photography website out there, but it’s a good available option for the purpose of exploring and writing about SEO audit topics. As we’ll see below, my Photoworks website does have SEO problems and related issues to explore further. So in that sense, it’s like a lot of other websites and provides a decent teaching example as an SEO audit target. This post also provides a working example of photography SEO for any serious photographers or other visual artists who may be interested in doing SEO for their own websites. I include some thoughts specific to photography SEO near the end of this post. Google is in the process of migrating from the old / classic version of GSC to new Google Search Console. Some reports and features are now available in the new version, while others are still only available in the old version. 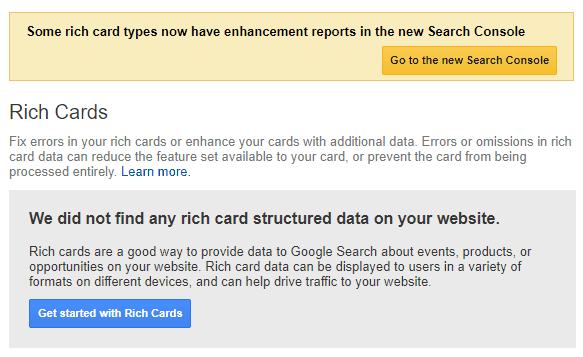 Some search console features have been renamed and/or improved in the new version. As of this writing (October 2018), I use both versions. I find some features, such as search query and page filtering, are sometimes easier and more intuitive in the old version. You’ll see that I use both versions in this post. Over time, I expect to update this post with new Google Search Console reports and screenshots. For the latest information on the move from old to new Google Search Console, see this help article. Google Search Console is the primary free SEO tool for analyzing the status and ranking of a website in the eyes of the Google search engine. While it is a very Google-centric tool, many of the issues and potential improvements detected here will benefit a website’s performance and visibility with other search engines as well. So, Google Search Console is an excellent starting point for doing SEO analysis for your website(s). Other free and paid SEO tools may also be useful, depending on your situation and needs. See this post for a number of free SEO tools provided directly by Google. The list of available SEO tools is long, indeed! Here are a few that are often helpful, in addition to Google Search Console. Some of these are completely free or have a free starter option before committing to a paid version. One of the first things you’ll want to do with Google Search Console is check for basic technical issues with your website. Here are some of the key areas, using my Photoworks website as the subject for this SEO audit. We’re looking here for basic information about how Google is indexing the pages of the website. As shown above, my website’s coverage in Google’s search index is in good shape. No errors or warnings to worry about. I’ve included the ‘Impressions’ overlay here (a simple check box). We’ll look at that trend line in more detail later. The drop-off in overall impressions since late July is definitely worth looking into. If my site is generating page errors for visitors (e.g., the ‘404 Not Found’ message), we’ll see that information here. The report above is from the old / classic Google Search Console interface. We see no issues with Site Errors at the top of the report. However, we do see some 404 errors (URL errors… Page Not Found) that deserve a closer look. Note that these URL errors did not show up in the new GSC ‘Coverage’ report! That’s interesting. So, I will manually check these 404 error pages and see if they truly are a problem, or not. The 404 error is not really an SEO ranking issue, but it can negatively impact user experience. So, it’s worth correcting these problems with URL redirects or other actions, as needed. Google Search Console will also show you if you have issues with HTML metadata on your posts and pages. For example, duplicate title and meta description fields. If left unfixed, these can become SEO issues that hurt ranking potential and/or click-through rate from Google’s organic search results. We see above that I have some work to do in the area of HTML improvements. Fortunately, duplicate page/post titles and descriptions are easy to fix. For WordPress users, the SEO plugin from Yoast makes it easy to customize these for every page and post. On the bright side, Google Search Console did not spot any issues with non-indexable content. Great to see that. Website owners are becoming increasingly aware that page speed, or page loading time, is an important consideration for SEO. It is definitely a Google search ranking factor, and has been for some time now. Google Search Console provides links to other helpful tools, and PageSpeed Insights is one of them. 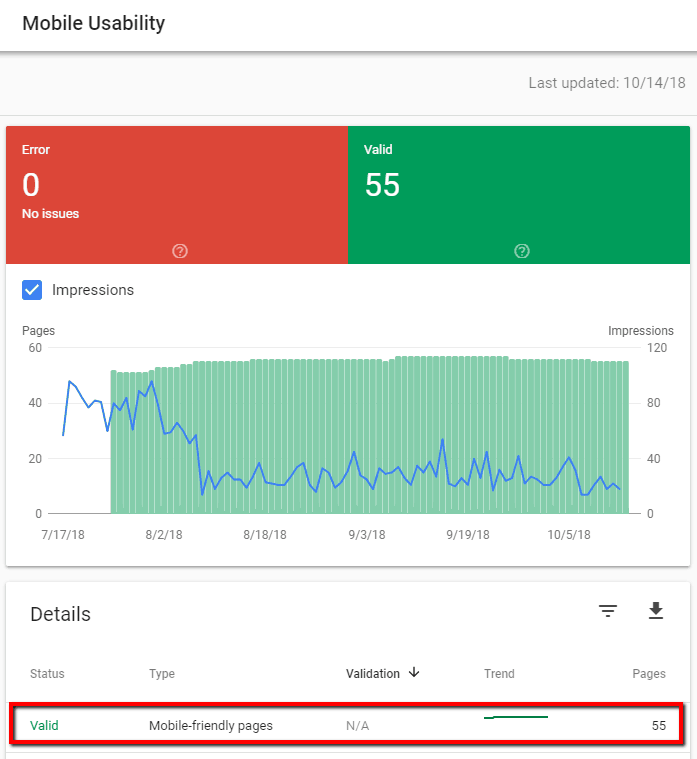 While the PageSpeed Insights tool is technically not truly integrated into Google Search Console, I do include it here since it’s directly linked from within GSC. Google is increasingly looking at all things mobile as it decides how to rank website pages. Google’s migration to ‘mobile-first indexing’ is part of this. They are using the mobile (vs. desktop) version of website pages to determine search rankings. Scoring well for ‘mobile friendly’ is no longer just a nice option for website owners who want to maximize their site’s SEO performance. My photography website is doing fine in terms of mobile usability. No major errors there. I am not really surprised by this since my site’s theme (GeneratePress) and pagebuilder (Elementor) are both great for developing mobile-friendly, ‘responsive’ websites that adapt automatically to different screen sizes and aspect ratios. 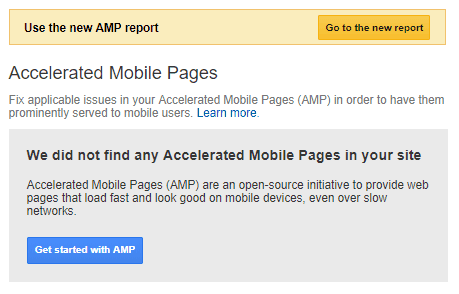 AMP is a relatively new open standard designed to speed page delivery to mobile devices. I have not yet added AMP features to my Photoworks website, so the report below is what I expect to see here. For WordPress users, there are AMP plugins available that will simplify the addition of AMP-ready pages and posts. It’s definitely worth a closer look for this site. For my Photoworks site, I’ll also need to evaluate AMP for suitability with image-heavy pages, embedded photo galleries, etc. In my opinion, Google Search Console is often overlooked and underutilized as a free rank tracking tool and keyword analysis resource. I’ll show you why here. For my Photoworks website, I know that some images and topics have been much more popular than others over the last few years. 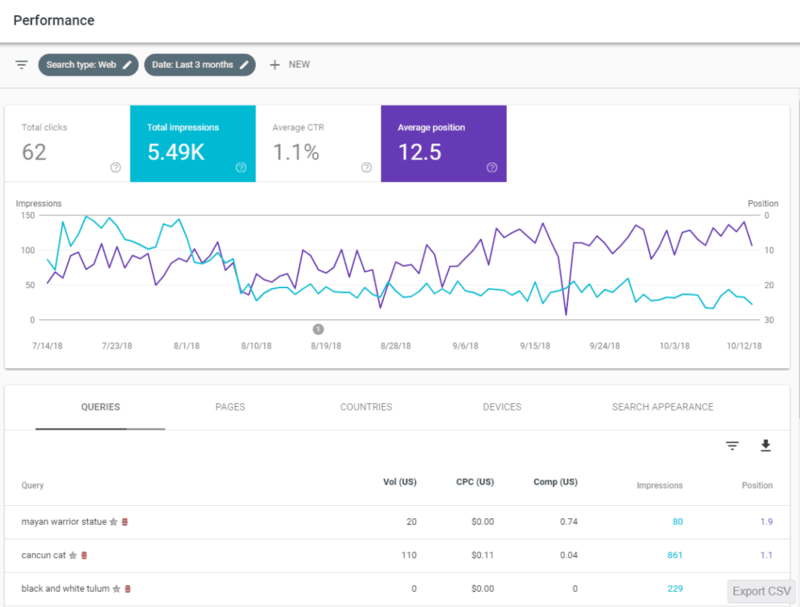 This is evident by looking at Google Search Console’s Search Performance data, as shown in several screenshots below. Note that in the screenshot image above, the Vol, CPC, and Comp columns are added by the Keywords Everywhere browser extension. See this post to learn more about using Keywords Everywhere for targeted keyword research in an SEO content planning scenario. As of this writing (October 2018), Google is in the process of migrating Google Search Console users from the old / classic interface to the new one. The prompts below about using the new GSC are typical, depending on where you are in the old interface. Some things in the new interface are definitely an improvement. Others, such as the filtering settings, take a bit more getting used to but do offer new capabilities. 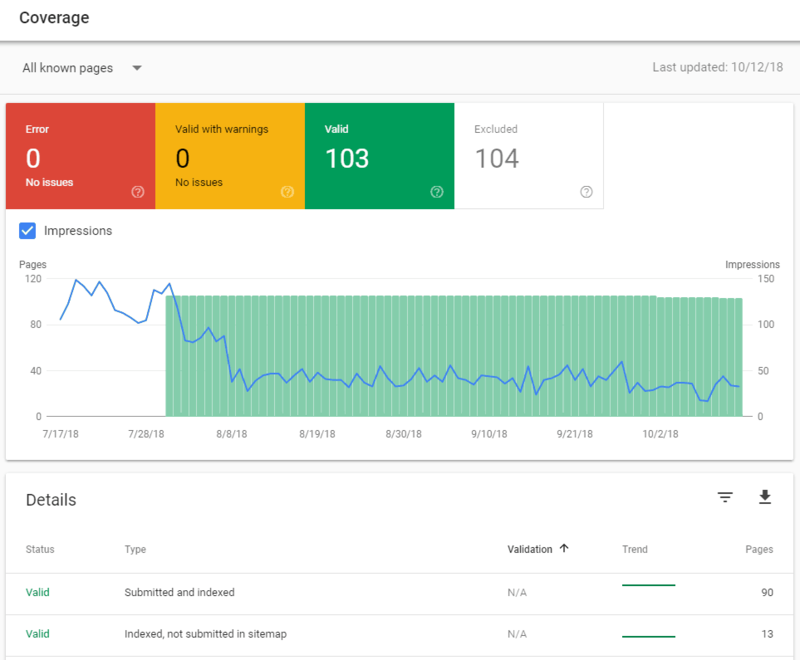 And some Google Search Console features, reports, and tools are still only available in the old version. So, I use both GSC versions for now. 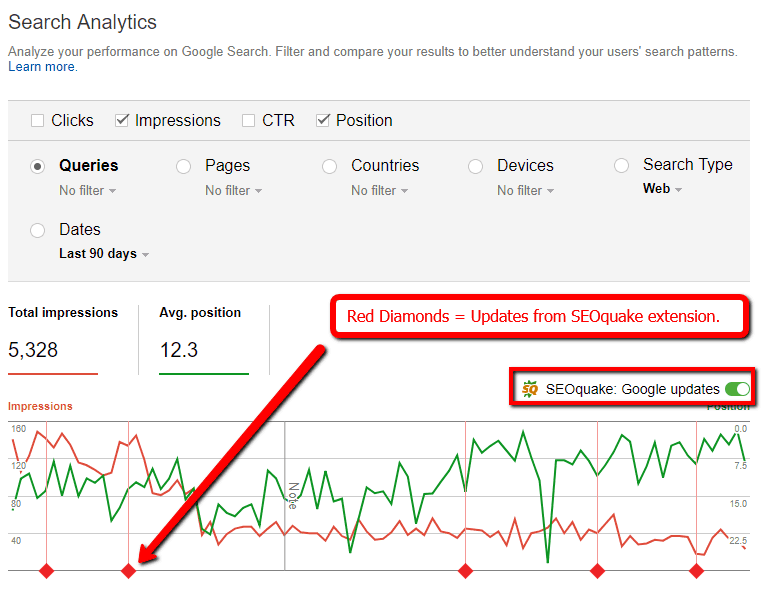 I like to use the handy SEOquake browser extension from SEMrush when using Google Search Console. 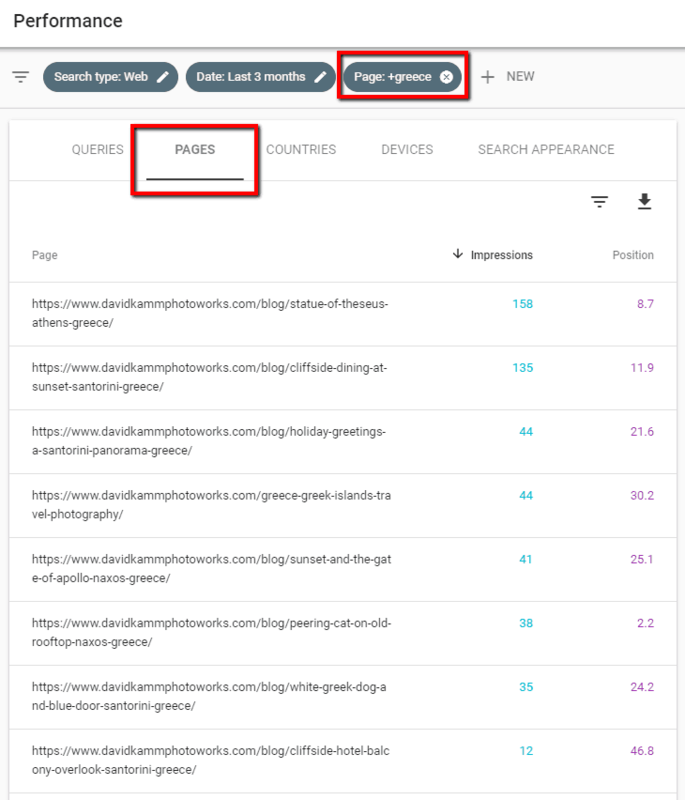 This extension places markers and notes on the Google Search Console timeline, indicating when the SEMrush team has detected an update to Google’s ranking algorithm. See the two graphics below. As of this writing, SEOquake only works with the old / classic GSC interface, shown below. Interestingly, my Photoworks website’s impressions start to fall off right around the time of the 7/31/2018 note from SEOquake. And yet my ranking positions increase pretty dramatically even while the impressions fall off. Looks like this could be related to Google’s algorithm update noted on 7/31. I did nothing new to the website during this period, so there’s no SEO action on my part that would explain any changes. So, that’s a quick intro to SEOquake by SEMrush. Pretty cool addition to Google Search Console! I hope they are able to migrate this functionality to the new GSC reports soon. We see below the results of looking at user search queries using the new Google Search Console Performance report. 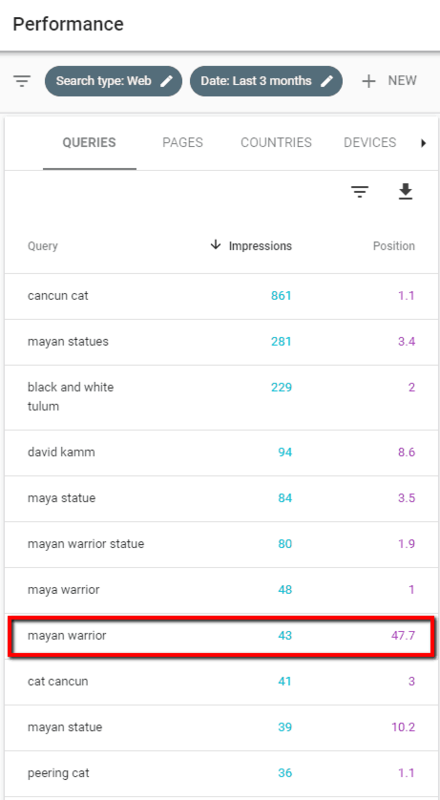 For various reasons, some of my images of ancient Mayan figures (photographed in Mexico’s Maya Riviera region, by the way) have become fairly prominent for certain searches. This is evident by looking at the query (or keyword) position data below. I’m pretty happy with this, but I can also easily see an SEO opportunity here. 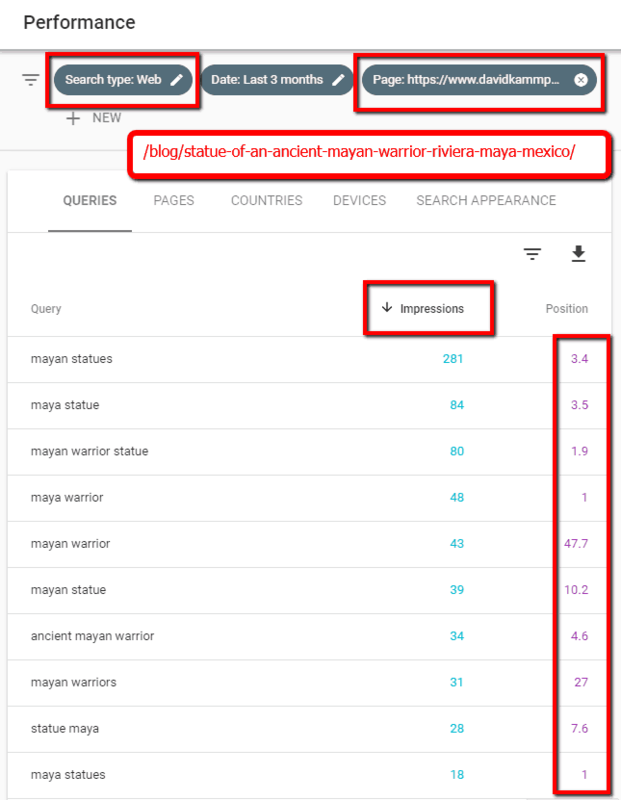 It looks like I could work on the keyword ‘mayan warrior’ to boost my content visibility for that specific search query. 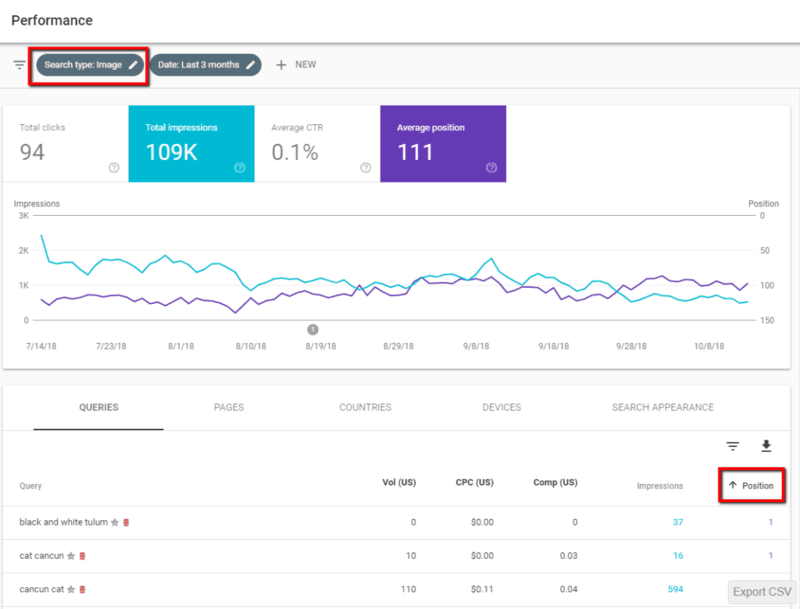 Looking at pages now instead of queries in the new Google Search Console, we see the impressions and position data for specific pages. I can quickly see which pages are ranking well, and which ones not so well, along with volume of Google search impressions generated for each. I’m pretty happy with several of these positions, though it looks like my page /croatia-travel-photography/ could use some SEO attention. 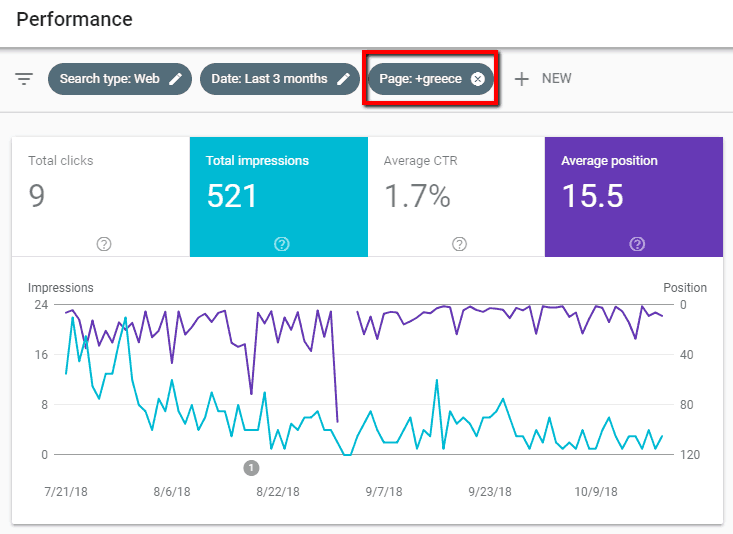 It’s easy in either the old or new Google Search Console to focus on a specific page (or subset of pages) and then look at other data, such as queries, that drive performance for that page (or pages). I’ve included an example below. 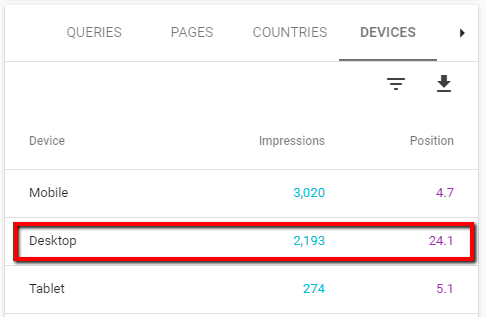 We can see here the specific user search queries that drive impressions and positions for a specific blog post. 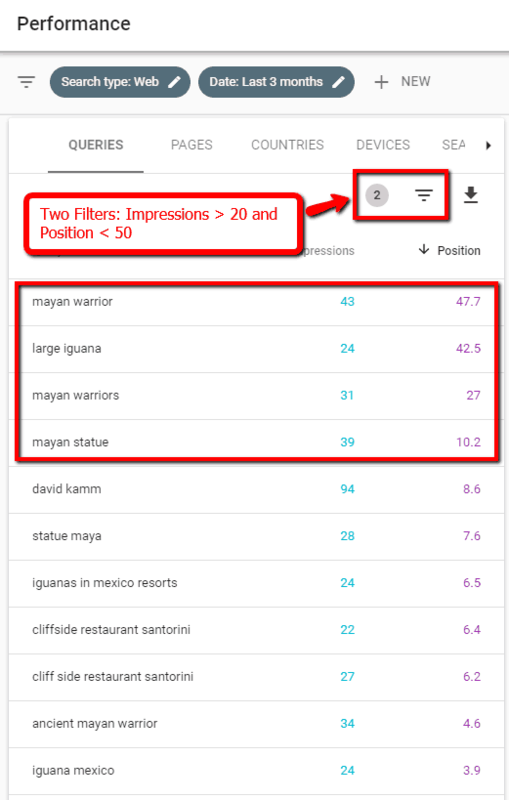 As noted before, there may be good opportunities to improve positions (and probably also impressions) for ‘mayan warrior’ and ‘mayan warriors’ search terms (keywords). These are ‘short-tail’ keywords that are probably more difficult in terms of earning high SEO rankings. Still, I should look at the page content to see if there are any relatively easy opportunities for making SEO improvements. 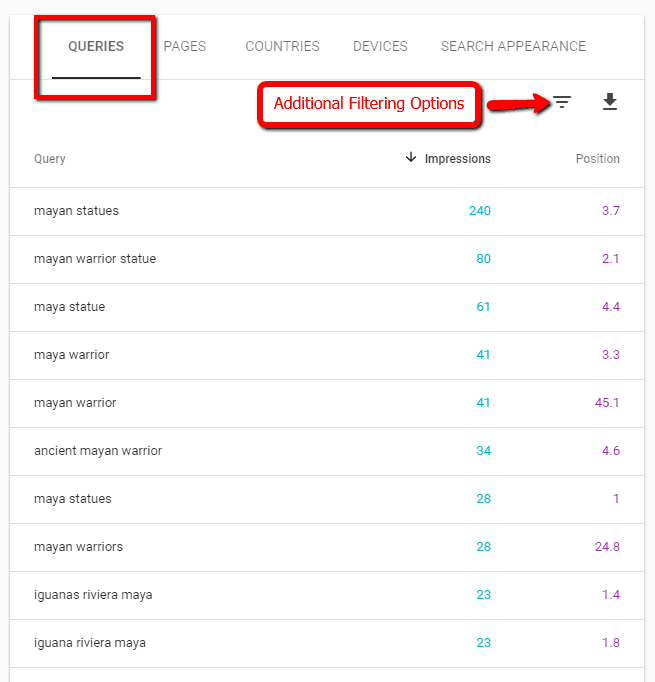 One of the key features available in Google Search Console is the ability to filter the search performance data into subsets that are more meaningful for SEO analysis purposes. I use Google Search Console filtering nearly every time I use GSC. I’ve included a couple of examples below. In this case, I simply wanted to look *only* at keywords generating a minimum (>20) number of impressions and a maximum (<50) position in the organic search index. 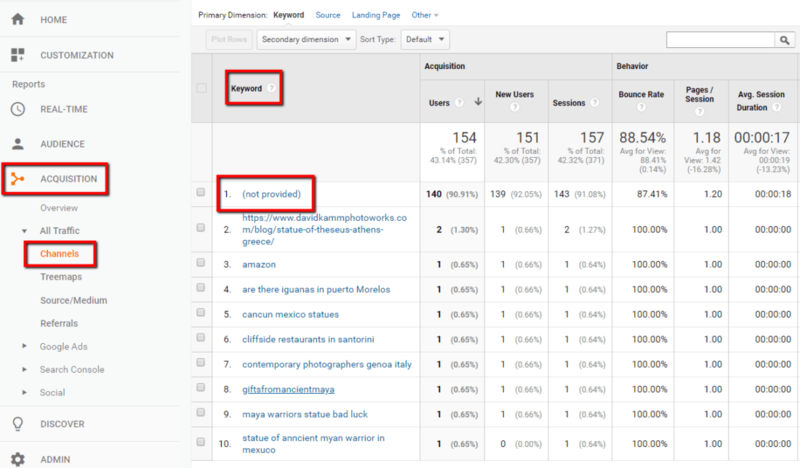 This analysis shows me that I can also look more closely at ‘large iguana’ as a keyword with some SEO potential. The upper row of filters that defines the overall report view. Search type, Date, and other filter options via the ‘+ NEW’ control. The table filter options directly above the data table of rows and columns. I use two table filters in combination in the example below. We can again look closely at impression and position metrics to see which pages are in need of the most SEO help. As a general rule of thumb, any *important* page that generates relatively high impressions today, but that sits somewhat low in position (roughly 11-40 or 50 range), may have great potential for ranking improvements with further SEO work. For photography website SEO, or other visually-oriented websites, it makes a lot of sense to also look closely at search performance for image-based searches. We do this by simply changing the ‘search type’ from Web to Image. 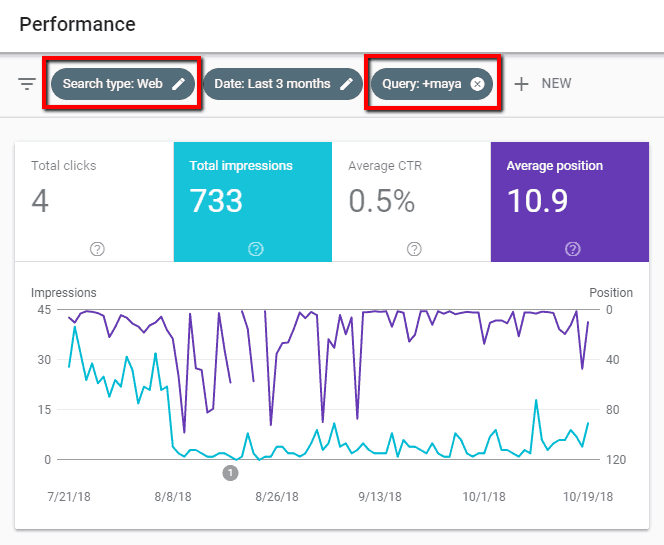 See below for an example from Google Search Console’s new Performance report. We actually see more raw clicks here (94 vs. 62), driven by much higher total impressions and a much lower click-through rate (CTR). And we have a much lower average position over this time period, for images vs. blog posts and site pages. Given the number of impressions here and the raw click volume, it’s worth taking a much closer look at my image-centric SEO to see what else I can do to improve this aspect of SEO for www.davidkammphotoworks.com. Similarly, there’s an option for focusing on video-centric searches in Google Search Console. My photography website currently doesn’t have any video content so I won’t go into that here. I definitely want to dive deeper into the image-centric SEO performance. But for now, let’s move ahead and look at some rank tracking features in Google Search Console. Rank tracking (or position tracking) is easy to do with Google Search Console. It’s one of those features I use all the time now, especially in combination with filters to really drill down to my specific areas of interest. Google Search Console’s filtering feature allows users to narrow down to specific individual keywords or groups of keywords in a ‘keyword theme’. 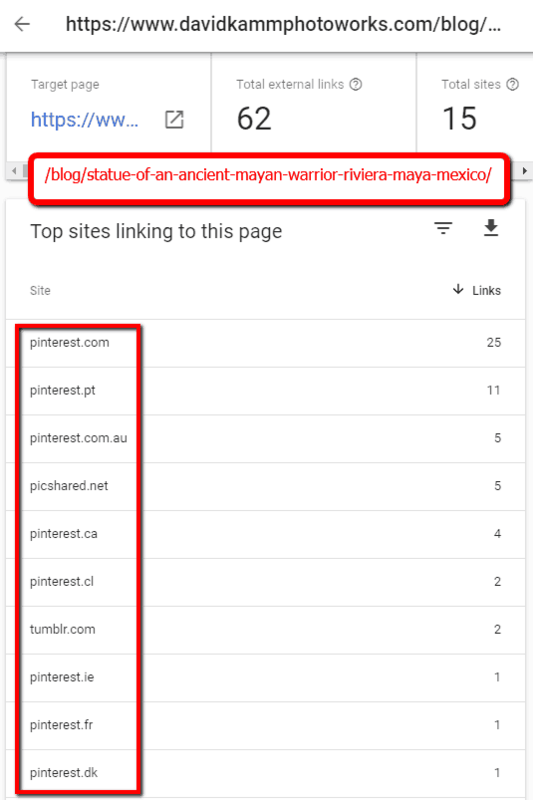 For example, for my Photoworks website I could set the filter to [mayan warrior statue] to see the trendline for that specific keyword. This is an example of an ‘exact match’ keyword filter. Or I could simply set the filter to ‘maya’ to see the trendline for all search queries that include that term (case insensitive). This is an example of a ‘keyword theme’ (my term for it)… giving me a way to look at clusters of actual user search queries based on a common term. See below for these examples. The screenshot above shows how we can zero in on a specific keyword by adding another filter up top. The broken purple line in the timeline tracks the average position. The gaps in this line are simply a result of having zero impressions on some days. As defined, all query results here contain some form of the term ‘maya’ in them. That’s an example of focusing down to a specific keyword theme. Once again, we see above the relatively weak positions for ‘mayan warrior’ and ‘mayan warriors’. There may be good opportunities for SEO improvements here. I could do additional filtering using the filter controls directly above the results table. In both cases above, I only used the upper filter options near the top of the report. Similar to keyword-based rank tracking, we can also use Google Search Console filters to look at specific individual pages or groups of pages or posts whose URLs contain (or do not contain) specific keywords. I’ve included two examples below. These are the top queries for all the pages above that included the term ‘greece’ in their URLs. 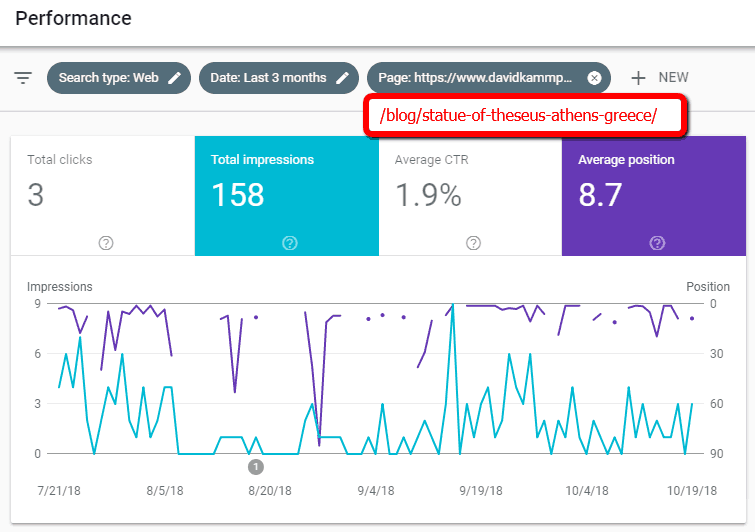 We’ve drilled down to a specific subset of pages and posts with the +greece page URL filter, and now we’re looking at the actual user keywords that drove organic search impressions of those pages. From the position metrics in the table above, it’s easy to see now why my photos on the subjects of ‘peering cat’, ‘theseus of athens’, and ‘cliffside restaurant santorini’ have been relatively popular. I should note that I also use Rank Tracker from SEO PowerSuite as an SEO rank tracking and keyword research tool. It’s a good complement to the SEO audit capabilities of Google Search Console. I’ve paid for the professional version of SEO PowerSuite (all modules) and I do use them regularly. I’m happy to see visitors from around the world find my Photoworks website. 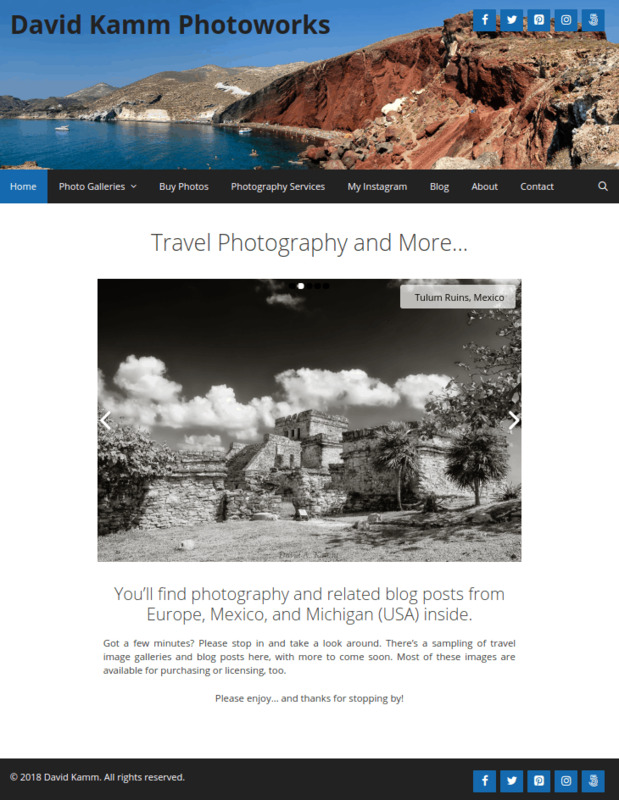 It’s primarily a travel photography website, after all, and I know people from all over the world are interested in learning more about these regions and photo subjects. Granted, since my site is entirely in the English language, it’s much more likely that it will be found via organic search in countries where English-based search is prevalent. See below for a view of the country breakdown as reported by Google Search Console. These average positions are fairly decent overall. I expect to see Mexico, Italy, and Greece in the mix here since I have photo content and blog posts specific to those countries. The surprise outlier here is India. With further analysis and specific SEO updates, I may be able to improve my average ranking (and therefore probably impressions also) for Google users in this very populous country. I also want to understand what device types my visitors are using and how my Photoworks content performs for each device category. The report below provides a 90-day look at that. I’m surprised to see the Desktop device category ranking well below the Mobile and Tablet categories. So, I need to dive deeper into this and see if there’s anything I can find and fix for better desktop SEO rankings. It may help to try to further filter or segment the desktop data to see if anything useful pops up. Google Search Console provides tools for doing basic link analysis, including internal linking and incoming links from other websites… also known as backlinks. GSC by itself doesn’t look at backlink quality the way the better pro SEO tools do, but it’s still helpful for taking an initial look at your website’s link profile. Here are some examples for my Photoworks website. The screenshot above is from the old / classic Google Search Console Links report. Note that – as usual – Google would *really* like me to use the new Search Console and new Links report here. We will get to that. 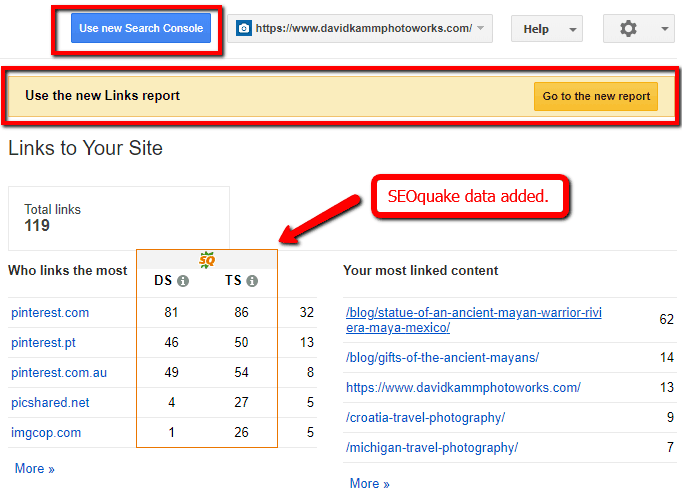 But we also see some useful data from SEOquake by using the old GSC report interface here. DS = Domain Score. This is a measure of a domain’s importance on a 0 – 100 scale. It is calculated similarly to Google’s PageRank, using volume and quality of links into the domain. Higher is better. TS = Trust Score. This indicates the trustworthiness of the domain, based on the number of backlinks from trusted sites pointing to the domain. Watch out for cases where TS is much lower than DS. You may not want backlinks coming from these sites. The screenshot below shows a partial view of the new links report in GSC. Here you will find information in four areas: External links (‘backlinks’), Internal links, Top linking sites, and Top linking text (‘anchor text’). To see full details in any of these areas, simply click on the ‘More >’ option at lower right corner of each list. Note that at this time, no SEOquake data is available here. I’m hoping that will catch up soon. The next screenshot shows the view after clicking More on the External links – Top linked pages summary above. You can apply further filtering here, as needed. For my Photoworks website in general, the great majority of incoming links are from Pinterest.com and other country-specific Pinterest domains. I initially shared many photos via my own Pinterest account, and they basically got picked up and ‘re-pinned’ from there. Others have shared on Pinterest directly from my website images. I have a WordPress plugin enabled that encourages easy sharing to Pinterest and other social networks. It’s probably obvious, but I would say that having simple and prominent sharing options in place is essential for any websites related to photography or other visual arts. Which external sites are linking to my web pages, and how? Are there any backlinking sites that look suspicious… and should I consider disavowing these sites? Have I added enough internal links to my most important pages? So, Google Search Console plays an important role in understanding your website’s ‘link profile’ and ‘backlink profile’. 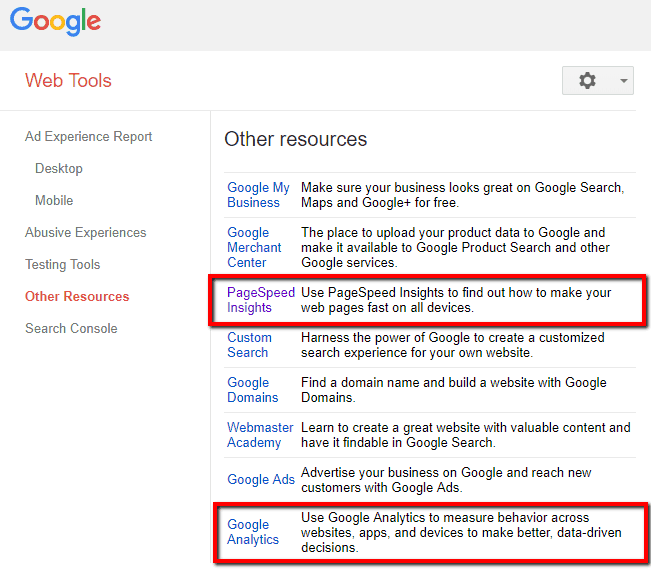 It should be part of your SEO audit process and toolkit. Still, many SEO practitioners find it useful and even necessary to add other tools for more robust link and backlink analysis. Most people who use Google Search Console probably also use Google Analytics on a regular basis. The two tools should be connected in order to generate the most comprehensive SEO insights. These include much better organic keyword analysis and how search users interact with the website beyond the initial click and landing page. The standard Google Analytics report below shows website user activity broken down into the default channel grouping. This includes organic search, social, direct, and referral channels. We can see here that organic search activity is driving most of the traffic to my Photoworks website. Next in line is the social channel, dominated in this case by traffic from different Pinterest domains. So, the Google Analytics report below shows us how organic search performs as a traffic generator, relative to other standard traffic sources. 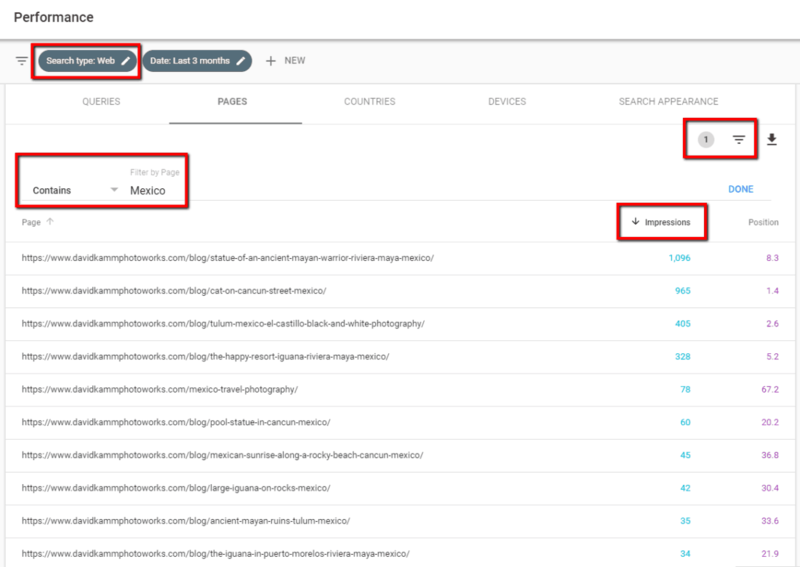 The next screenshot shows search keyword data provided by clicking through on the organic search line in the Default Channel Grouping above. As usual in this Google Analytics report, the vast majority of keywords fall into the familiar ‘(not provided)’ line. 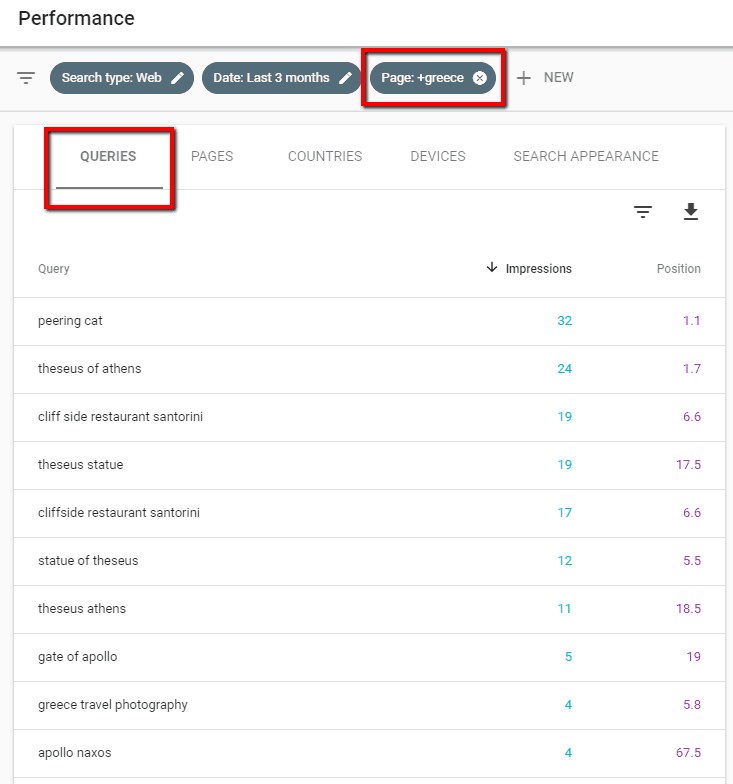 One of the reasons for connecting Google Analytics and Google Search Console is to reveal more of these actual keywords and connect them with other useful GA metrics. As we can see above, a few other keywords (or keyphrases) may be visible here, in addition to the (not provided) line. To answer the question in keyword line 4 above: Yes, there definitely *are* iguanas in Puerto Morelos, Mexico. Lots of them! Here’s one that posed nicely for me. 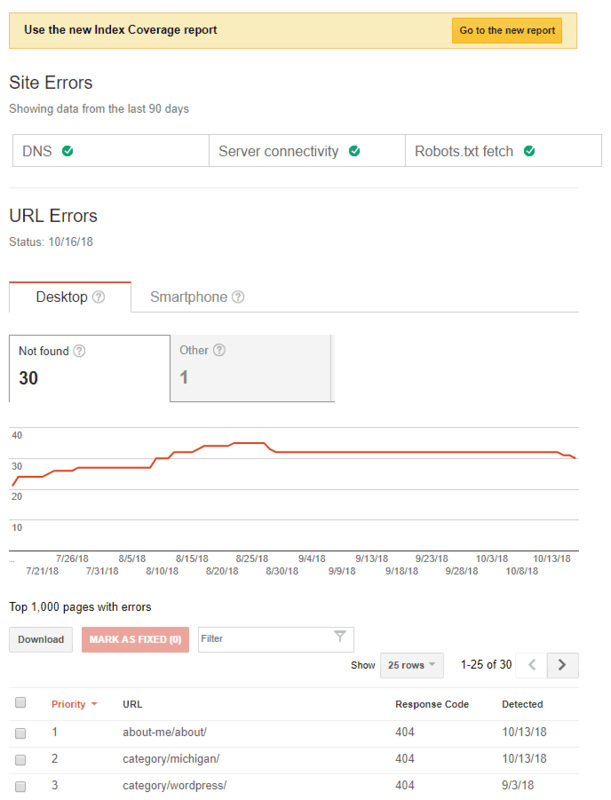 Note: The two standard Google Analytics reports above do not require any connection to Google Search Console. That comes next. 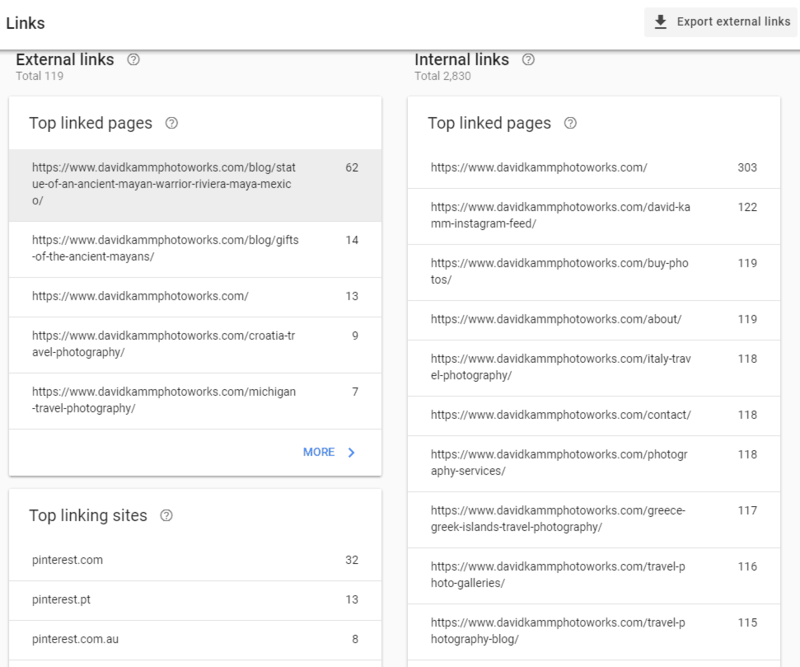 The screenshot below shows a report made possible by connecting Google Analytics with Google Search Console. 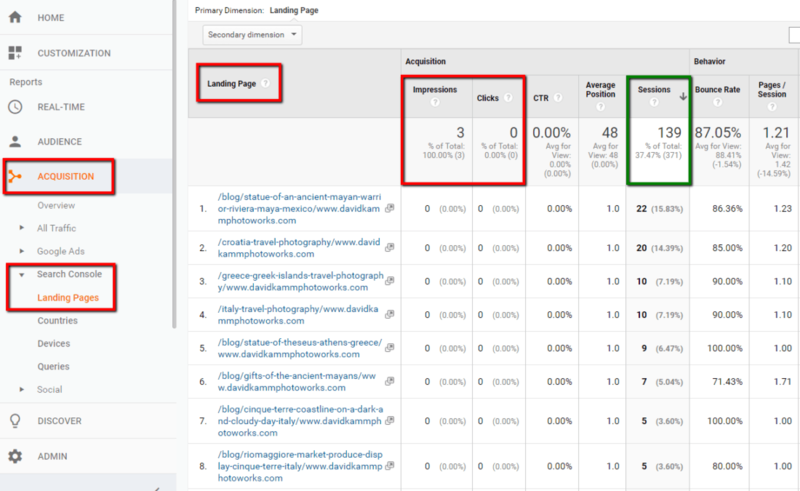 In this case, we see landing page data along with other standard metrics pulled in from Google Search Console: impressions, clicks, CTR, and average position. Next to these GSC metrics are other standard Google Analytics metrics: sessions, bounce rate, pages per session, etc. Conversion metrics are also included to the right of the Behavior metrics. What is interesting here is that the sessions metric (139) looks OK, but the impressions and clicks metrics do not look correct. It makes no sense to me that these landing pages would show no impressions or clicks while still showing positive sessions numbers. This is something I will need to look into further. It appears I may have some kind of data integrity or data connection issue to sort out here. This data integrity issue appears again in the screenshot below, where we see only three impressions showing in the Google Search Console data. At least the number of impressions (3) shown below is consistent with the earlier report. 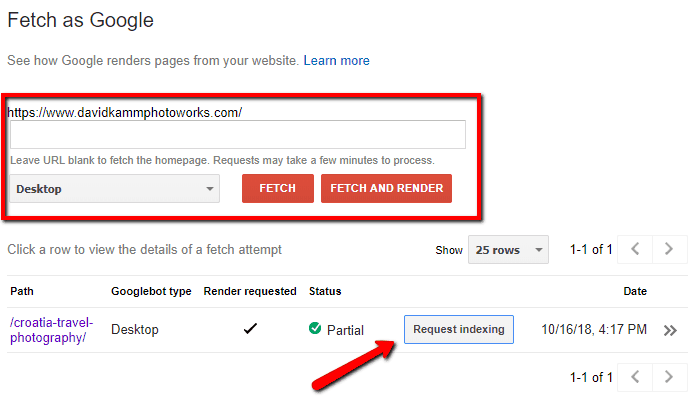 To debug this issue, I will first go back into Google Search Console for my Photoworks site and see what clues I can find there. UPDATE Oct. 30, 2018: I discovered and fixed the problem with Google Search Console data. It turns out that my Google Analytics for this site was still connected to the http version of my Photoworks website. That’s why we see the very low numbers for impressions, etc., recorded in Google Search Console. GSC is simply no longer collecting any search metrics for my non-https website. So, I deleted that original GA-GSC association and replaced it with a GA association to the https version of my site. I had already established the https property in Google Search Console in April 2018, when I cut the Photoworks website over to https. But I had apparently forgotten to update this association in GA back in April. I’m confident I will start seeing correct search console data in these reports within a couple of days. Go to Admin >> Property Settings >> Search Console in GA, then verify the settings there or update the association, if needed. 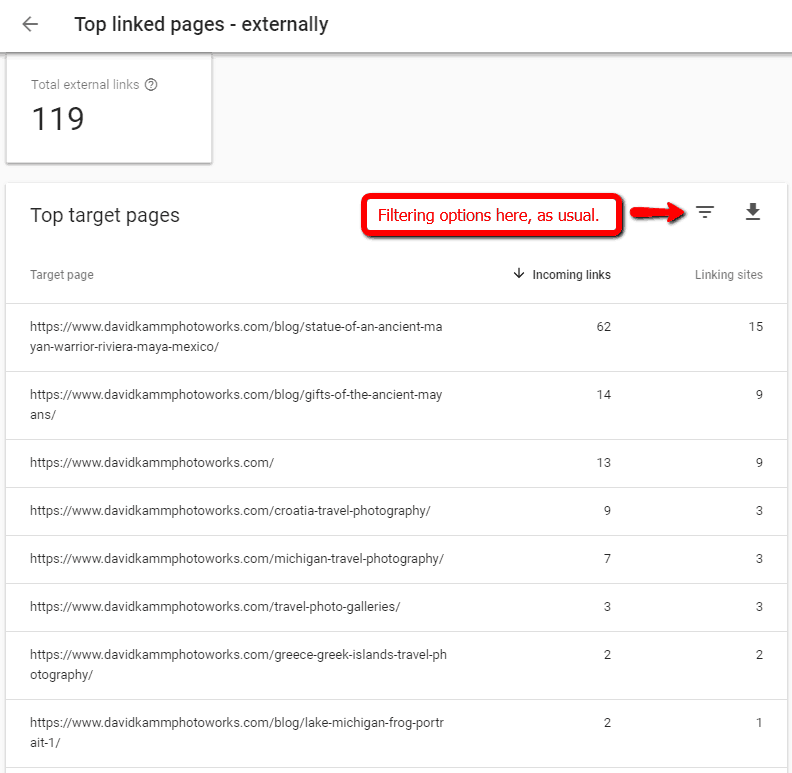 This section has offered a quick look at how Google Search Console integrates with Google Analytics, although with some data issues that I seem to have cleared up now. 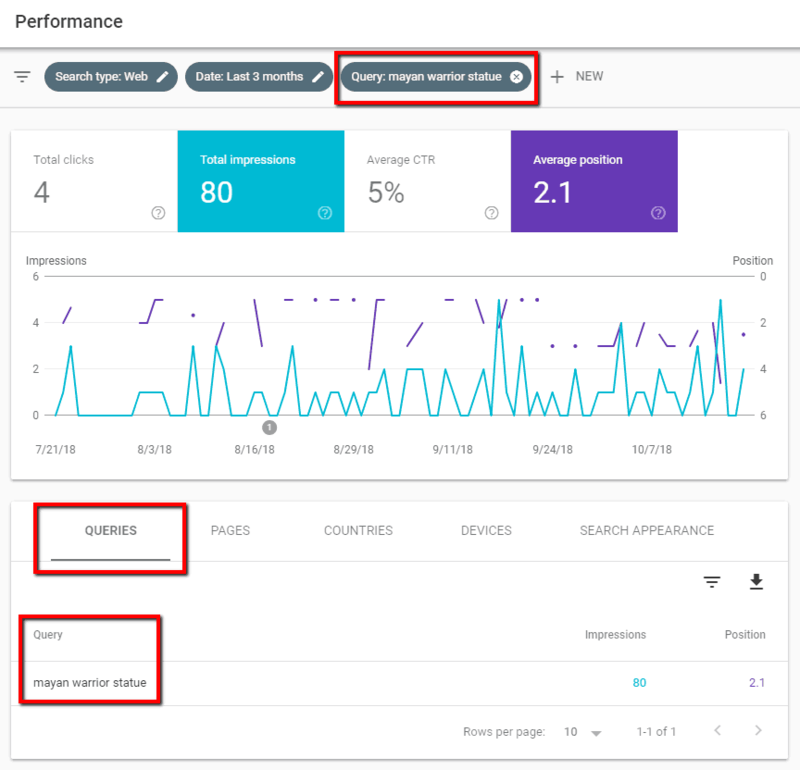 When things are working correctly here, you will be able to view the search performance metrics available in Google Search Console in the context of useful Google Analytics visitor metrics. Other areas of Google Search Console are worth reviewing as well, as part of a thorough SEO audit. I cover these briefly below. Note that some of these GSC features are still only available in the old / classic version of Google Search Console. The report above shows that my Photoworks website *currently* has no issues in this area. However, there was clearly something going on here during summer 2018. I will have to look more closely at this to learn more. 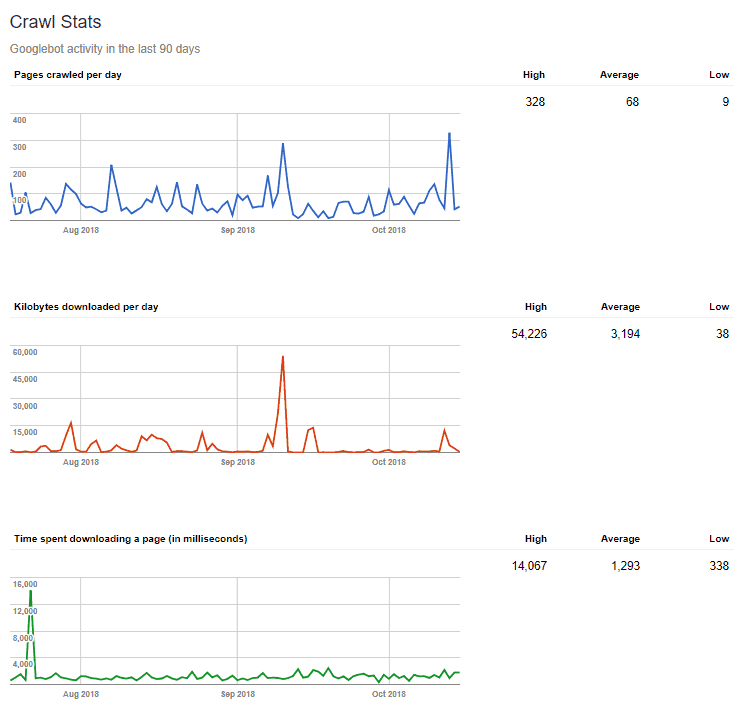 The Crawl Stats report looks fine to me overall. I can see that Googlebot is crawling the site regularly. The only notable issue here is the unusual spike in download time from ~ mid-July. This appears to have been a one-time thing… perhaps a server speed issue or a photo gallery rendering problem? I’m not going to worry about it unless I start to see more frequent spikes popping up. 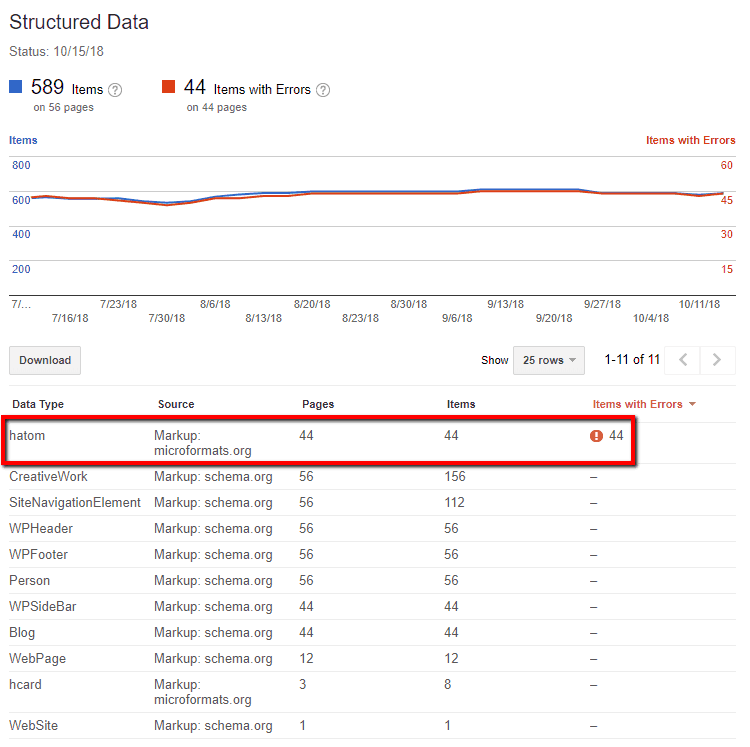 If your website includes structured data using markup formats as defined by microformats.org and/or schema.org, then the structured data report in Google Search Console is worth checking. The example below is from my Photoworks website. It shows that I have 44 errors to review, for data type ‘hatom’ in the microformats markup scheme. I will need to do some further research here to see if these are critical, or if I can basically ignore them for now. On the bright side, the report indicates that all of my schema.org markup is correct. Note that I personally did not do anything to enable structured data on my Photoworks website when building it. I believe that the schema.org markup elements were essentially ‘built in’ to my GeneratePress theme. So it makes sense to see good results above in that area. As described in the screenshot below, Rich Cards are helpful for certain types of websites and businesses. They help with search visibility and how pages appear in various search results. Rich Cards can be an important SEO element for many websites. I currently don’t think this is important for my Photoworks website, so I have not enabled any Rich Cards data. However, suppose you are a professional photographer who holds regularly scheduled events, gallery showings, teaching events or webinars, etc. In this case and others like it, then Rich Cards may be worth a closer look for you. You may also want to understand more about the Data Highlighter function in Google Search Console. This tool helps simplify the process of tagging structured data in a way that makes it easy for Google to understand and display in search results. This tool lets you fetch (or fetch and render) a specific URL to see how Google processes your website’s pages. Results include a status of the fetch operation, and (optionally) a partial rendering of the target page. 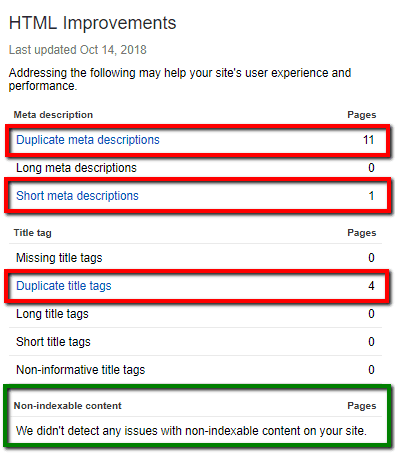 I use the ‘Request indexing’ feature when I’ve made fairly substantial changes to a page and want the Googlebot to visit and re-index the page right away. The view below is from the old / classic Google Search Console. The ‘URL inspection’ feature in the new Google Search Console offers this capability as well, along with other useful features. 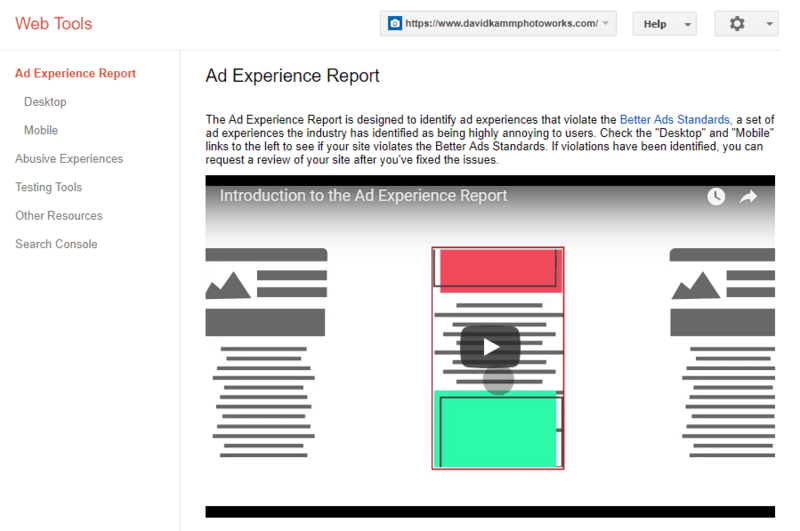 If your website hosts ads, then the Ad Experience report may be relevant for you. If so, check both the desktop and mobile options here to identify any problem areas. This report is currently only available in the old / classic version of Google Search Console. The Abusive Experience is also worth a quick look, to see if anything unexpected has occurred here. Seeing ‘Enforcement: Off’ here for my Photoworks website is a good sign. No worries here. Since I’m using a photography-centric website as the test site for this post, I want to offer a few observations that may be helpful for other photographers and visual artists who use websites to promote their works and services. Photography websites and other visual arts sites may often have pages that are heavy on visual content but light on text. They may only have brief gallery introductions, then image titles and (maybe) image captions. When Google crawls and ranks these pages, Google may view them as ‘thin-content’ pages and demote them accordingly as web results. Google may index and rank the images themselves quite differently under ‘image’ results (vs. web results). To counter the thin-content issue for website pages, visual artists should add further descriptive text that weaves in appropriate and sufficient main keywords, keyword variants, long-tail keywords, and latent semantic indexing (LSI) keywords. For WordPress users, the Yoast SEO plugin will be a big help here. The LSI Keyword Generator may also be very helpful. Like any other website owner with serious SEO intentions, photographers and visual artists should be certain to maximize the easy opportunities for SEO improvements. These include Title and Meta Description settings for each page and post, and the metadata that should always be added to each image on the page or inside a gallery… most notably the alt tag text. Note: The page or post title is separate from any image titles. Also, the image filenames should be keyword targeted. This is not a huge SEO factor for Google, but can certainly help support other SEO elements. Part of my personal SEO workflow for WordPress is to change the names of image files *before* I upload them to the WordPress media library. Using correct image sizes and compression are important for most websites, and even more so for image-centric photography and visual arts websites. These sites often have ‘image-heavy’ pages, with visual content dominating the task of rendering the full page in the browser. We need to pay attention to pixel sizes (height and width), image file sizing (KB), etc. For page speed reasons, including positive user experience and SEO rankings, it’s important for these highly-visual sites to leverage proper image sizing and effective compression that reduces page loading times while still keeping image quality acceptable. Also, for sharing images to social photo sites like Flickr, 500px, etc., be sure to maintain the largest and best quality image on your own website. Only post or share smaller and lower quality images to social sites. Why? Because this helps Google determine that your hosted image, not a shared version of it, should be ranked higher in Google image searches. Is your photography website or other visual arts website mobile friendly? Are you *sure* it is? How does it look on the most popular iPhones and Android phones? Do your image galleries perform well on mobile phones and tablets, without major formatting or display issues? Do your social sharing features still work great for mobile users? Have you tested your website’s main pages and posts using several of the free mobile-friendly test tools from Google and others? Google is very focused on the mobile experience these days, for obvious reasons. They include mobile-friendliness factors in their search ranking algorithm, so we want to pay attention to this area as well. With better SEO comes better search visibility and improved website visitor traffic. That’s the good news and the main objective of this exercise, of course. But… with increased image visibility comes the much higher odds that some of your hard work will get ‘ripped off’ for use elsewhere. I’ve seen many of my images get re-used on other personal blogs. Most don’t ask my permission, while a few do. Some don’t ask permission but then voluntarily include a link back to my Photoworks website. I don’t spend much time trying to track all of this down and enforce copyright issues. But, if I ever find a *commercial* entity trying to make money off of my images, then that may change quickly! For professional photographers, professional visual artists, and others who make a living off their visual works online, there are a couple of good ‘reverse image search’ tools that may be very helpful. Of course, you can always slap a prominent ‘© Copyright Jane Smith, 20xx’ watermark across your images online. The pros and cons of this approach have been well covered in various photographic forums. There’s no single simple answer for all website and image owners when it comes to copyright protection. 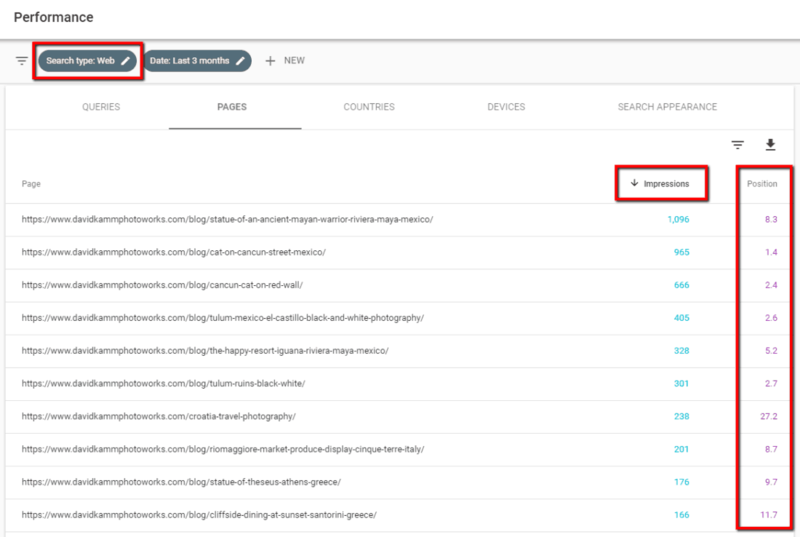 This post provided a basic introduction and walk-through for conducting an SEO audit using Google Search Console. I hope it has been helpful and spurred further action and thinking on your part. Secondarily, I hope that some serious photographers and visual artists find this post and learn something useful from it for doing image-centric SEO. As I mentioned in the introduction, I view Google Search Console as the one free SEO tool that all serious webmasters and content marketers should become really good at using. It is great for SEO audit purposes, as used above. It’s very helpful for doing website health checkups as well. There are many other tools available for SEO audits. Some are free, but many carry an ongoing cost commitment. 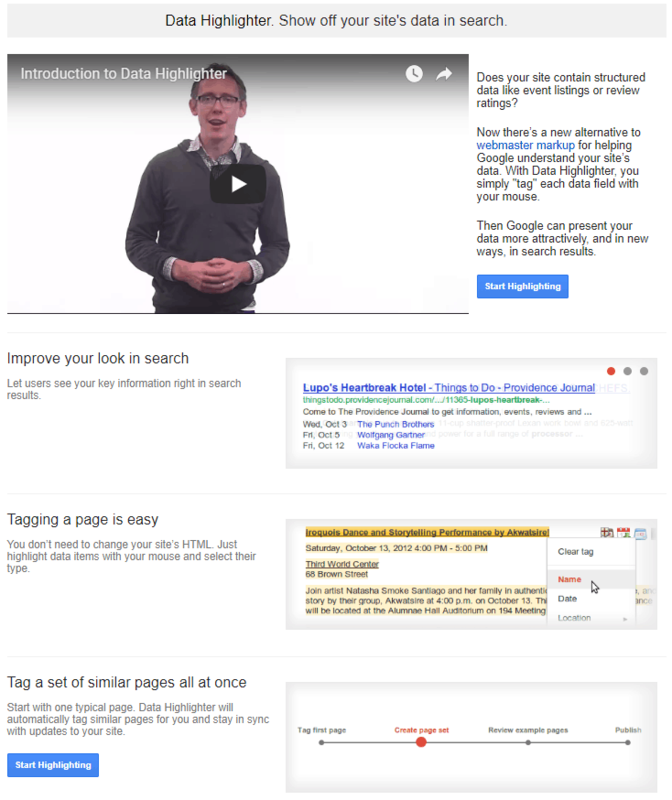 Google Search Console is the first free one to get started with. I continue to learn more about SEO and SEO audits as I work with Google Search Console on my iBeam and David Kamm Photoworks websites. I will continue to use my Photoworks site as a ‘learning lab’ and teaching tool as I move forward in this area. As with all my longer and more recent posts, I plan to come back to this post to flesh out missing details, add new insights, and make corrections and improvements where needed. I’ll wrap up here with just a few questions for you. What else would you like to know about Google Search Console and SEO? What other SEO tools do you like to use for SEO audits and other SEO tasks? If you’re a photographer or other visual artist with a website, how do you currently handle SEO? Thanks for reading, commenting, and sharing with your social networks, too. Thanks for including that Keywords Everywhere’s extension is why I am seeing comp (competition) in Google Search Console’s Performance Report on the Queries tab. This is the only place on the web I could find that information. Hey John, you’re welcome! Glad that helped. I should also note that it’s not possible to sort on the three Keywords Everywhere columns in GSC. I wish it was. You can sort by the usual GSC data columns in the Queries view, just not the three columns that KW Everywhere inserts.